I’d love to meet this plant up close and personal, as it looks really interesting. A bit hoary too perhaps? The colour of course is fabulous. It is an interesting plant. All that red that’s going on belongs to the bracts: the actual flowers, those bits of yellow-green inside the bracts, are quite small. Every now and then people find yellow ones, but I’ve only seen one in the past three or four years. There’s another species in the hill country that’s a lighter, purer orange, and one in the Chihuahuan desert called woolly Indian paintbrush — it’s much fuzzier than this one. You’re right that this has hairy stems, but they’re less noticeable with the naked eye. Thanks for this. I grew up with a late summer wildflower that we always called an Indian Paintbrush with a beautiful orange/red bloom at the top of a tall spindly stem. It is a wonderful dash of color in the dry months. After seeing yours and how different it was, I finally looked up the true name of my local plant. It is hieracium aurantiacum – Orange Hawkweed. It’s also called the Devil’s Paintbrush but we never got that memo. Now I know. Your hawkweed’s pretty. It doesn’t surprise me that you like the color. I think I’ve seen it in some of your paintings. “Hawkweed” sounded familiar, so I looked it up. We don’t share the Devil’s paintbrush, but there is a yellow hawkweed that’s as hairy as can be and that’s known famliarly as long-bearded hawkweed. It’s listed as native in just one Texas county, according to the USDA, but I saw it in Missouri, and I think in Arkansas. It’s great fun to learn about the similarities and differences across the country. I just discovered that there is a beautiful species of paintbrush in NY — looks to me like it might be close to you, too. It’s one of 116 species (!) of paintbrush in the country, and it’s a beauty. You can see the map and a photo here. It’s Castilleja coccinea. That’s a good out-of-season gift, especially as you found not just one but a group. I’ve found an occasional lone paintbrush in the summer. In fact when I was driving the car the other day Eve said she spotted a paintbrush out her window. Experiences like that one and yours probably explain why Eason extended the paintbrush season into the summer. You could e-mail him to find out. When it comes to seasonally appropriate colors, that December paintbrush you found certainly outshines poinsettias. While I was looking through the various Castilleja species in Eason’s book, I came across C. citrina, the lemon paintbrush. I’d love to see that one. It has one of the most interesting distribution patterns I’ve seen. The nice thing about paintbrush is that they are easy to spot. Especially with a little sunlight, even solitary plants attract attention, as Eve can affirm. I’ve just been looking at the BONAP map, and discovered that there are 116 species listed there. One of them, C. coccinea is found in New York: close enough to Gary Myers that he might well have seen it. The fact that it’s present there may help to account for the ‘paintbrush’ name being applied to the hawkweed. I see that Castilleja coccinea is marked for New York’s Nassau County, where I grew up. As you’ve pointed out, there are over a hundred species, and every one of the 48 states is home to at least one. Better make that 49. Alaska’s got one, too. My goodness. That’s a beautiful flower. It must have been quite a delight to find that one. It reminds me of the species I’ve seen in the hill country: C. lindheimeri. I think I might have seen it once around Nash prairie, too, but I was so new to native plants that I thought it was an anemic paintbrush, and I paid it no mind. Better anemone than anemic, I always say. Next time you’ll pay it some mind. I’ve been reading my own comments about the paintbrushes on your blog, and laughing. It’s really fun to see how confused I was, and to realize how much I’ve learned over these years. I still can be mightily confused, but I’m more likely to be aware of my own confusion now. It’s interesting that some wildflowers and other native plants will bloom “out” of their season and then you read that, in fact, they’re doing what they do. Still, it’s a nice *lagniappe* when it happens. Funny — I thought of that flower as a little lagniappe, myself. Great minds thinking alike, no? I found a bit of information about paintbrush that I don’t fully understand, but I thought it was intriguing. Paintbrush are what’s called hemiparasitic; they draw some nutrients from other plants around them. Changes in those surrounding plants can affect the paintbrush. However that happens,some researchers suggest that different bloom times may be affected by more than external factors like temperature and the amount of rain. Apparently, their hemiparasitic nature’s what makes transplanting them almost impossible, too. You’d need to get not only the paintbrush, but the roots of the other plants they’re tangled up with. Bring on the seed! I was about to ask if this hemiparasitic quality could be responsible for the different bloom times and the lustre,or lacklustre, of the paintbrush season. I am pleased, wildflower ignoramus that I am, I am not alone in this line of questioning. Now? Like you, I always spot them in Spring….maybe it’s because it’s too darn hot to go out that I’ve missed them during summer. Ah, Scarlet? Tomorrow another day? There’s no question that we miss a good bit during the summer. It seems like only yesterday the coneflowers, basketflowers, bluebells, and baptisias were in full bloom. Now, they’ve completed their cycle, and they’re busy making seed. I’m sure there are other interesting things going on, but I’ve got plenty of pretty flower photos to keep me amused until the weekend highs drop below 90. By the way, I heard last night that the tick population suddenly has exploded. People who were out in Armand Bayou, Deer Park prairie, and the Texas City prairie preserve found themselves covered with the nasties. The only woman who didn’t have much of a problem was one who sprays her clothes with permethrin. Just a word to the wise. Odd: spotted red leaves already on the crepe myrtle while watching the morning squirrel commute. Usually Dec for that particular one…the weather and clouds types have been different so far. It really is lovely. It must be spectacular in a field of them. They can be quite a sight, Kayti. To tell the truth, my favorite way to see them is combined with either bluebonnets or other wildflowers. Depending on what they’re mixed with, the color you see can be quite different. Fields where the red paintbrush mix with bluebonnets often appear — what else? Purple! I think many species of plants are confused with the weather. I know a couple of mine are! All of a sudden I’ll walk out of the house and think ‘where did THAT come from – it isn’t March! But isn’t it nice to have such pleasant surprises? We were lucky this year to have a stable, extended spring with plenty of rain, and we’re reaping the benefits now in the fruits that are so plentiful — especially peaches. Apparently the conditions are just right for some of the flowers to have a second spring, instead of an extended spring. It’s fun to see. Beautiful “Spring” bloom, Linda! :) Global weather conditions are changing, and plants are likely going through some strange transitions. 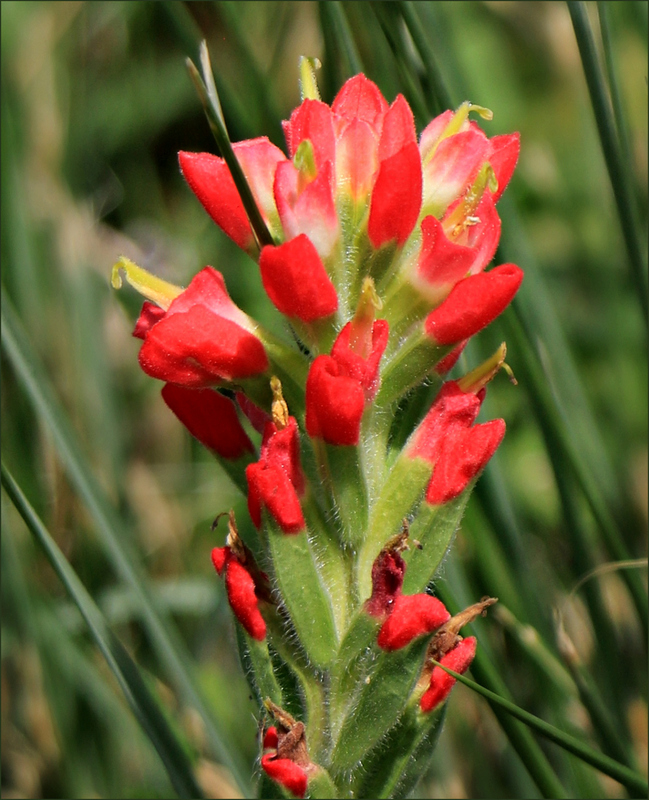 I remember being puzzled by the late bloom of the paintbrush this year, and by their relative scarcity. Eventually, they showed up, but in different places than I’d ever seen them — and then I found these, in exactly the places I’ve seen them the past three years. Odd, indeed, but that’s part of the fun. If we knew the exact where and when of the flowers’ appearances, it wouldn’t be nearly so enjoyable. What does Nature know of books? She recks well her own rede and blooms when and where She will. Precisely. As strange as it might seem, we’re not in control of everything that happens in this world. Coming to terms with that leaves us free to enjoy a good bit that’s going on around us. It’s beautiful, I’ve always liked a good rich red. I had the same experience as RedTreeTimes describes above, a wildflower that everyone around here calls Indian Paintbrush, and never knew it was really Orange Hawkweed until now. I’d never heard of your hawkweed, but it’s a beauty. I left a link to another hawkweed — a yellow one that’s more common in a swath of the middling-west — in my comment to Gary. Believe it or not, there are 116 species of paintbrush, but most are in the western half of the country, and some are limited to only one state, like Montana or California. However! There are two species in New York, and one of them is pretty common: Castilleja coccinea.. From the photos I’ve seen, it’s an even richer red than this one, without the orange highlights. I suspect if you ever come across it, you’ll notice it. Lovely vivid hues and a nice find. I’ll have to find a swampy spot and start looking for cardinal flower. They were especially appreciated given the general fading going on as summer begins to transition toward fall. It’s only been in the past couple of years that I’ve really seen the waves of color rising and falling. For weeks, it seemed like purple was everywhere. Now, new yellows and whites will begin arriving. And in the midst of all that? Bits of red, like your cardinal flower, to please the eye. A very attractive flower and I suspect lovely to see covering a lot of ground. I wonder if there are many un-seasonal flowers around the world with the adverse weather conditions. August is usually our wettest month in Melbourne, but so far, there have mainly been just intermittent fairly light showers. It has been quite cold though, so no doubt the ski resorts have done quite well this year. There’s always something that surprises me about your country. I confess that ski resorts never crossed my mind, although I have become aware of your mountains. We get a picture of a place in our minds, and then it takes some time and some experience to sort out the fantasy from the reality. Of course Australia has kangaroos, boomerangs, kookaburras, and that Outback, but it’s so much more than that. It crosses my mind that part of our political/cultural problems may be rooted in the same phenomenon. We have pictures in our minds of what the “typical” [fill in the blank] is like, and too often don’t take the time to do a reality check. I hope your garden continues to do well, despite the cold. If I could send you a little of our extra warmth, I certainly would. Aaah, this is really beautiful. I have never seen them blooming here in summer but then it might be possible since I don’t cruise around in the summer, The days of July and August are very hot and dry here in central Texas so I tend to believe that there is no blooming. That is a marvelous photo too. I am glad that you can find the time to explore and find these glorious plants to share with your followers. There are a lot of us who don’t cruise around much in the summer, Yvonne. You’re not alone. I actually went down to the refuge to see if our slight rains had helped with the freshwater ponds and ditches. The short answer’s “no.” But, I did find these flowers, and a few others, and that was a nice surprise. I’m really looking forward to any sort of cool down. Every year I swear I’m going to arrange things so that I don’t have to work in August, but that didn’t happen this year, either. So — on to September! I found a huge field of swamp sunflowers last year, but they got mowed down before I got a photo, so I’m hoping that they’re back this year. That’s a beautiful paintbrush! It’s much smoother and softer looking than our species here. They can become leggy and bedraggled by the end of their season, but they certainly are pretty when they’re fresh. I think their relative compactness adds to that sense of smoothness you mentioned, and the color can be so saturated, they seem to glow. We’ve been experiencing a late bloom of Indian Pipes aka Ghost Flowers. Usually we see them in late spring or early summer but this year, at least in my yard and a few other places I find them, they are just popping up now. Your paint brushes are much more appealing. I just looked up the Indian pipes to refresh my memory, and I must say — they are odd little plants. I was glad to be reminded that they aren’t a fungus. I would have thought so if I’d found one in the woods. What’s odd is that, given my love of white flowers, the Indian pipes don’t grab me the way a rain lily or white prickly poppy does. Maybe if I saw some real ones, they would, but in photos they have a gelatinous appearance that’s a little off-putting. Of course, compared to the paintbrush’s vibrant red, nearly everything pales a bit. They are more like pale flesh which leads to another aka…corpse plant. In addition to the white, they are sometimes tinged with pink. Still not as arresting as a paintbrush. Speaking of corpse plants, there is a fungus called dead man’s fingers (Xylaria polymorpha). I like to believe that we have had an unusual winter here. I think that almost every winter.Yet every year, almost to the day, the cherry blossom at the end of the street, the magnolia and the apricot in my garden, bloom on schedule. For the cherry it’s usually in full bloom by 7 August, the magnolia in full bloom by 26 August, and the apricot by the second week of August. Even knowing this, I still see the first blooms and say, with great surprise, “Gosh, that’s early this year.” My plants must laugh at me! The plants have perfect knowledge of their seasons. We love being in control, able to predict events and behaviors, but nature’s not so easily understood or predicted. Ask any weather forecaster! And yet there are patterns, repetitions, dependable changes. Your magnolias and apricots are proof of that. To paraphrase Pascal, perhaps the flowers have their seasons, which our seasons do not know. Thank goodness we still can admire them and rejoice in their constancy, even as we delight in the surprises they offer. I always think of Indian paintbrush as a cheery beauty, and I’m thrilled to learn it can bloom in summer, too. This might be just another example of our weird weather. Everything we’d planted on the south side of the house was growing beautifully up to this year when it seems to have mysteriously died off. I’m talking roses, crepe myrtles, etc. I refuse to dig them all up until next year though — optimistically, I hope something might be salvaged in spite of Mother Nature. Lovely photo, Linda. Your strange die-off might be weather-related, but it could be something else, especially since the crepe myrtles died. They’re tough plants. Is it possible that a neighbor might have gotten a little frisky with a sprayer filled with herbicide? If the wind was blowing in your direction, there’s no telling what damage could have been done. Sometimes, a pathogen gets into the soil. I watched apple orchards in the hill country go down in a year from cotton root rot. Check the branches. If all the leaves are gone, but there’s still live wood under the bark, they might survive. How long have they been kaput? Have you seen any growth at all? As for the paintbrush, we say it’s “normal” for them to bloom from March through May, and most of them do. But there always are flowers that decide to pop up when it suits them, and they’ve been doing it since naturalists started keeping notebooks. That’s what makes a visit from something like this paintbrush so much fun; it’s like having a friend you haven’t seen for years suddenly show up on your doorstep. Thank you, Linda, for your suggestions. You know, I’d wondered the same thing, especially since our neighbor’s north side suddenly appeared lifeless (that’s the side closest to us). A tree specialist scraped one of my crepe myrtle’s branches with his fingernail and proclaimed it dead. I haven’t given up hope though. I know they’re sturdy critters, so I’m going to wait and see what next year brings. Who know? Maybe there’s life beneath the soil after all! Actually, the guidebook just came out; it was published in 2018. Because of that, it’s filled with new information: taxonomic changes, notes on expanding or diminishing ranges, revised bloom times, and so on. 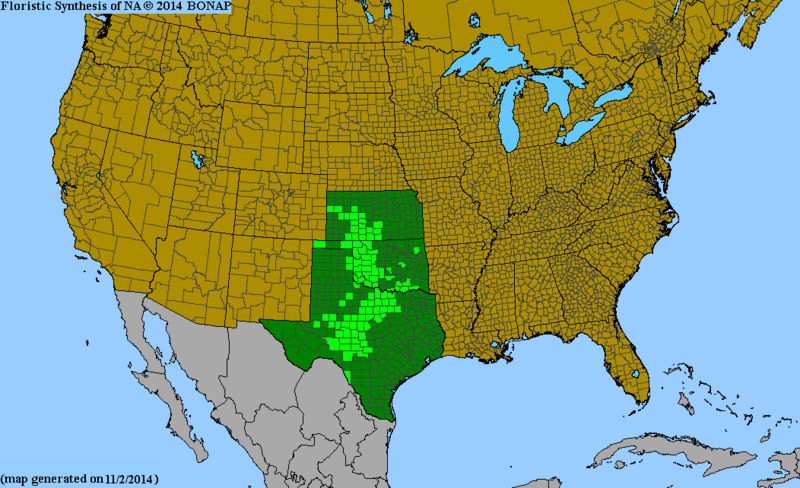 Best of all, it covers plants across Texas, which is a huge plus. One of the interesting things about much of Texas is that our seasons aren’t as sharply defined as in other parts of the country, so many of our plants will bloom across the traditional seasons. Just for grins, I selected 8 pages from Eason’s book at random. Of the 24 wildflowers shown, 12 of them were listed as blooming in spring, summer, and fall — including three species of paintbrush. We don’t lack for flowers, that’s for sure! I checked out Eason’s book and I probably could use it too. Most of what grows in the southern part probably grows in Florida too. I suspect that’s so. On the other hand, it’s important to remember that far south Texas, and west Texas (the Big Bend area, especially) tend to be desert-like, or at least much, much drier. The large number of ecoregions in Texas (from 10-12, depending on the source) is remarkable, and the differences among them are substantial. Eason points out that here in SE Texas, we get up to five feet of rain per year, while Brownsville gets around 24 inches, and far West Texas even less. Elevation makes a difference, too. Eason distinguishes among plants found below 3500 feet, between 3500-5000 feet, and above 5000. Something new for me is the concept of “sky islands” — places with elevations as high as 7000 feet that have their own plant communities. If I’m ever to see those, I’m going to have to get myself in better hiking shape. Still, I think the book’s wonderful, and surely would make a good addition to your library. Although small, the photos are useful, and he’s a good writer. The very fact taht it includes information on more than 1200 species is remarkable.